The photo looks south to the Gulf of Mexico. 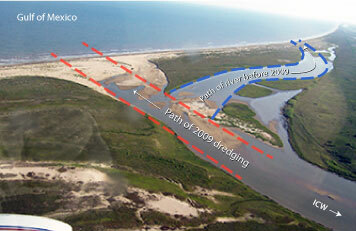 The red dotted lines show the path of the Feb. 2009 dredging that opened the mouth to the Gulf of Mexico. The opening silted closed in Dec. 2012, due largely to the lack of fresh water flowing down the river to flush out the accumulating sand coming from the Brazos River to the east. The blue dotted lines show the path of the river before 2009. Boaters beware as this area is very shallow. Boating here will just buy you trouble. Never assume the birds have long legs.